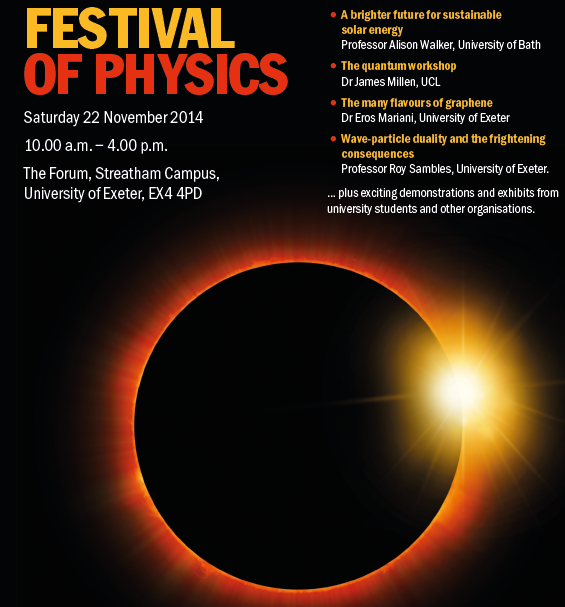 The Quantum Workshop will be appearing at the Institute of Physics Festival of Physics on Saturday 22nd November. We will be giving a talk and appearing as an exhibition. Come say hi! James has just started his second year of giving public quantum physics lectures at the Royal Institution. Head over to the media page to see the videos! 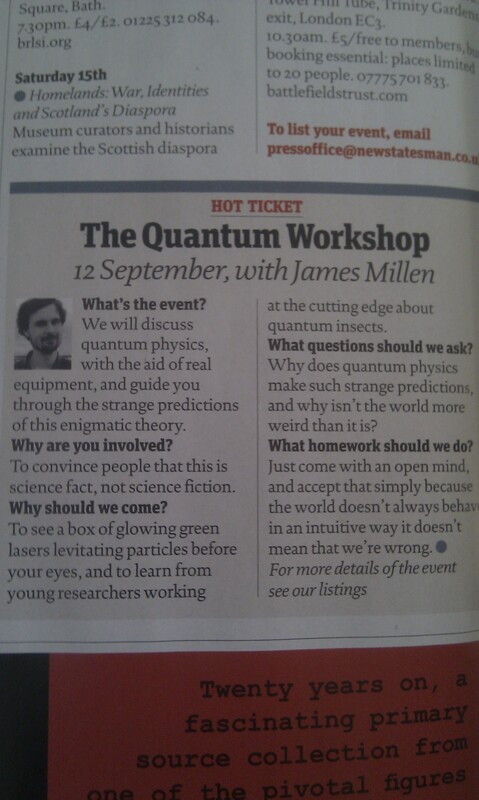 TQW’s pub talk advertised in The New Statesman! We made it into a national publication, hooray! 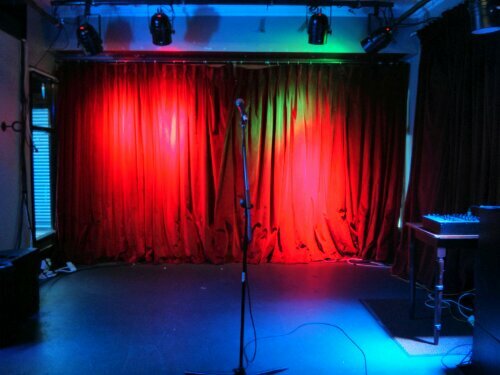 Tonight, 12th September, we’ll be talking in The Lamb pub on Lamb’s Conduit Street in London from 7pm, we will have our glowing laser box. We will mention quantum humans. 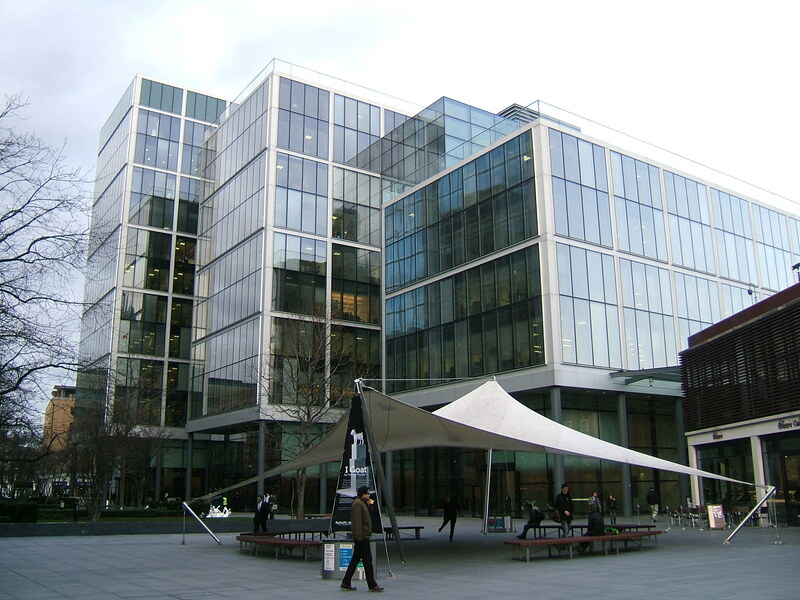 Many thanks for Science London, the London branch of the British Science Association for hosting us. It’s all going MAD in the Quantum Workshop. 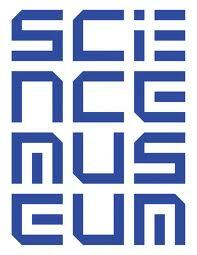 On the 29th August we will be doing a sci-fi themed Science Museum Lates. This event is one of the things that inspired us to set this whole project up in the first place. It should be an amazing evening. And then on 2nd September we will be trying out a completely unique public engagement experiment: setting up our glowing laser box in Spitalfields Market on a busy market day, and bugging the predicted 30,000 passers by. It’s going to be mad. Please come along to both. More info on the Events Page. 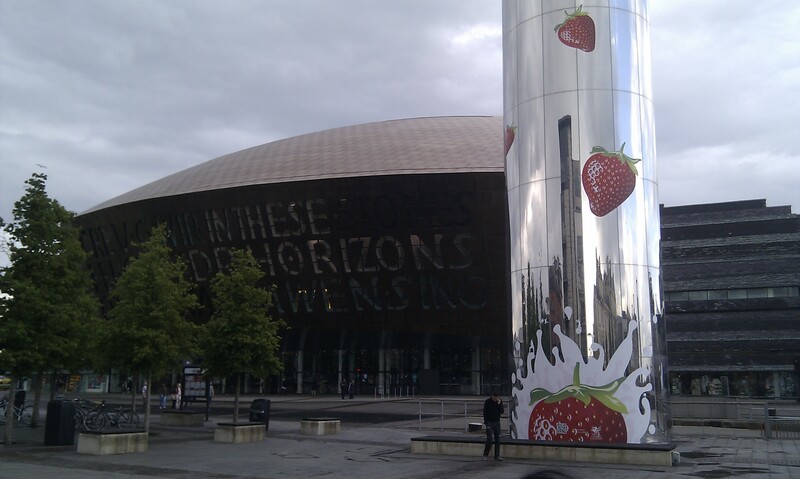 We had a great time at Cardiff Science Festival 14-15th July, mixing with artists, people with an IR camera that could see through certain clothing, and minor science engagement celebrities. Got pretty deep with people this time guys, free will and quantum physics. Lia got broody. We stayed in a Premier Inn on the side of a motorway. Quantum glamour! Best feedback: “astonishing!!!!!!!!!!!!!!!!!!!!!!!!!!!!!!!!!!!!!!!!!!!!!!!!!!!!!!!!!!!!! !” and “… my kids are now OBSESSED with physics & want to buy a laser”. As always, more pictures on our media page. 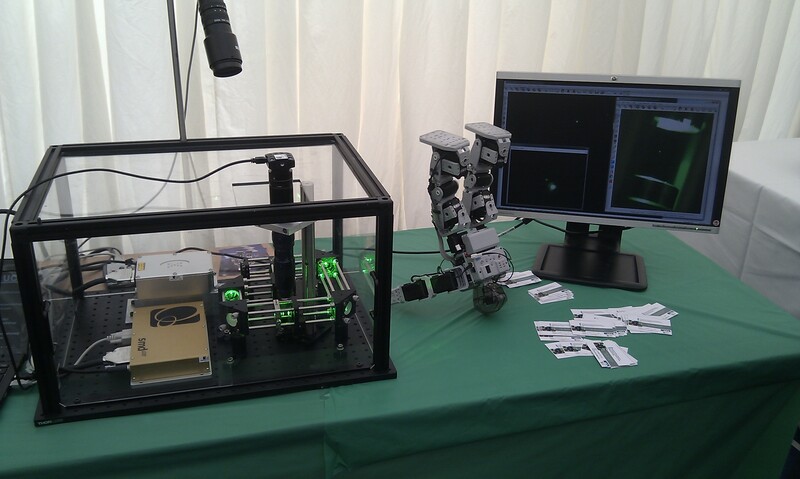 We had a super-fun day in the Adults ONLY Area 42 tent at the Times Cheltenham Science Festival on Friday 15th June. 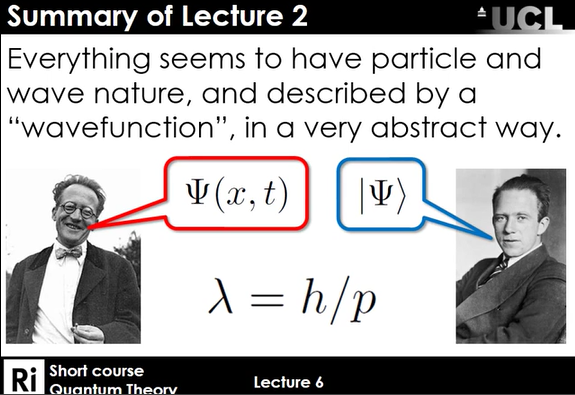 We really managed to get into the nitty-gritty of Quantum theory with a very receptive audience. We also danced with robots, drove a tank, saved a life, threw hearts at each other, sniffed a rotten fish, drank a coke float, ate a Scotch Egg and a head-sized meringue, glared at people from Imperial, ate too many mints, baffled a Nobel Laureate and fashioned our business cards into a focussed Gaussian laser beam. Good times. Many thanks to Dr. Matty Hoban and Dr. Janet Anders for helping James and Lia on this looooong day.